Karl Mayer, the leading German warp knitting machinery manufacturer, welcomed 760 visitors at last month’s five-day-long ITMA Asia + CITME trade fair, with the company’s stand being particularly busy during the first three days of the fair. Roughly 300 participants also visited the in-house show at Karl Mayer (China), which was held at the same time. “ITMA Asia + CITME 2018 was a successful show, with many visitors from China and also from other countries in and around Asia. Our stand was THE meeting-point for the sector, with its modern design, innovative machines and solutions designed to cater for current trends. We have shown that we are also pioneers in the future issues of sustainability and digitisation, and we are opening up new opportunities for our clients,” said Arno Gärtner, Karl Mayer’s CEO. The highlight of Karl Mayer’s presentation was the company’s demonstration of its digitisation strategy: the launch of the company’s own digital brand, Km.On, and the presentation of the associated digital solutions and the Karl Mayer Digital Factory, the start-up behind Km.On. “With the much-viewed brand launch and our first digital solutions, we were clearly showing that we are an expert partner for the digitalisation. Both our customers, as well as other textile machinery manufacturers, welcomed this initiative, which successfully positioned us as a real innovator,” said Arno Gärtner. Another focal point of Karl Mayer’s presentation were systems concentrating on greater sustainability during production, under the heading of Cleaner.Productions, and these were also a great success, according to Arno Gärtner. “We have shown that we are a global market leader in the field of sustainability as well. We have further developed our warp knitting technology in terms of environmental protection and presented it as a beneficial ecological alternative to other technologies,” he said. The possibilities of replacing weaving with warp knitting quickly became a magnet for the public. Both weaving and warp knitting companies were also interested in the Terry.Eco for the environmentally friendly production of terry goods. The highlights for the warp knitting sector were tricot machines with three guide bars. An HKS 3-M, 280" and a TM 3 were on show. The extra-wide HKS 3-M was producing a velour fabric in a gauge of E 32. Referring to the TM 3 the guests were particularly interested in the opportunities for market expansion offered by the TM machine. It produces warp-knitted fabrics, which can be used to replace the fabrics woven on water-jet looms, thus offering advantages in terms of costs and sustainability. Specific machines at the well-attended in-house show at Karl Mayer (China) in Changzhou were the TM 4 TS-EL terry warp knitting machine and the new five-bar tricot machine, COP 5 M-EL, 180". An RD 7/2-6 EN, 138" from the RD machine range was premiered at the in-house show. This new machine was presented as the first prototype. With 6 mm reduced flexibility of the trick plate distance, compared to the established RD 7/2-12 EN machine, it is said to deliver a 30% increase in speed. Karl Mayer was also showing two lace machines at the in-house show. The OJ 83/1 B was producing a fine lace band during the show, and the new Leisuree.Fashion, type LM 41, was also presented as an attractive machine for producing functional, multibar lace in a gauge of E 28. Karl Mayer’s Warp Preparation Business Unit was demonstrating the new Isodirect direct beaming machine and the VSB Size Box. The technology of the Isodirect makes it an efficient direct beamer for the mid-range segment. Two features in particular have set it apart from the rest of the market: the smart reed for automatically adjusting the reed to suit the required yarn number and beam width, and a well-thought-out system to optimise the interfaces between the direct and the Prosize sizing machine. The key element of the Prosize is the VSB Size Box, whose application system is designed to help reduce costs and the environmental impact. Up to 10% of the size alone can be saved, the company reports. “Traditional warp knitting companies in particular see the opportunities of opening up new business areas. Weaving companies with experience of technical textiles are surprised at the high productivity of warp knitting. 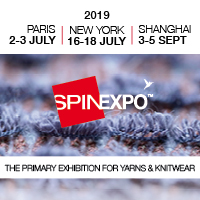 Depending on the application, the cost:benefit ratio of warp knitting to weaving may be 1:17,” said Hagen Lotzmann, the Sales Manager of the Technical Textiles Business Unit.